A custom patio is perfect for entertaining, relaxing and escaping from it all right at your own home. Your patio can expand your living space to the great outdoors. Just imagine your morning, watching the sunrise while drinking a cup of coffee or watching sunset with your friends and family in the evenings on your beautiful custom design patio. If you are unsure of the right design, Koch Kuts Landscaping has passion and experience in Paver Patio design. Koch Kuts offers patio design and installation services to homeowners throughout Burlington, Waterford, Elkhorn and surrounding areas. Whatever your lifestyle and needs may be for your new paver patio – we have you covered. Custom Patio can make your backyard experience fun no matter what time of day it is! With a stylish and up to date patio design, you can entertain guests outside on warm summer day or add a fire pit and roast marshmallows on a cool fall evening. Koch Kuts Landscaping can design and install a custom patio in any sized yard, small or big. A patio for can be used to transform awkward or sloped space into useable area. Check out some of our Before and After Patio images to see the transformations we’ve already achieved and get an idea of what we can do for you. Concrete Patios are available in a range of different colors, shapes and sizes. We can customize your patio to fit your style and needs. First identify the area where you will want your new patio installed. Paving stones – tile, brick, antique cobble, slate, flagstone, weathered stone and old world cobble stone. Contact Koch Kuts for your free paver patio estimate in Burlington and surrounding areas today. 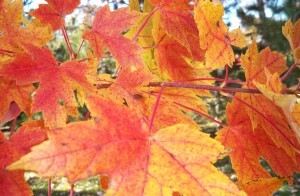 With the temperatures dropping nothing is better than having a beautiful fall color display in your landscaping. Choosing the right trees and scrubs for your yard can result in stunning color variations in fall. Burning Bush: This tough shrub earned its common name because of its autumn hues: In fall, the foliage turns glowing shades of red and pink. Maple Tree: A great, extra-reliable tree that makes a big statement in fall, sugar maple offers gorgeous red, orange, or yellow end-of-the-season leaves. Witch Hazel: A true plant for autumn, witch hazel leaves turn golden-yellow in fall. As they drop, they are joined by yellow flowers. Smokebush: Loved as much for its summer purple or gold foliage and plumes of soft, shimmery flowers, smokebush also offers great fall color — often in bold shades of orange and pink. Sumac: An incredibly tough shrub, sumac provides some of the brightest red color you’ll see in autumn. Sweet Burch: A beautiful tree, we love sweet birch for its cinnamon-colored peeling bark and triangular dark green leaves that turn beautiful golden-yellow in fall. When planning your landscaping, choosing trees and shrubs that give you a beautiful color display in the fall will add stunning color and beauty to your landscape. Contact Koch Kuts for your Fall Landscaping Estimate in Burlington and Surrounding Areas.